man who wrote the story, the forgotten master of crime fiction, and that Hitch's film almost word for word films his great story. 1940's stinkers Spellbound and Notorious, Marnie with bad acting male bimbo Sean Connery, that eternal smug grin on his face, yuck! ever made), some really old British one i can't remember the name of (a man with a bomb on a bus something), and then this one. Here follows some ramblings from a film nerd ... Beware of boredom! some of my favourite movies of all time, as The Magnificent Ambersons and Citizen Kane by Welles and The Third Man by Carol Reed. Cotten at the graveyard after the 2nd funeral of Harry Lime, without even looking at him, full of disgust and to the Anton Karas theme. Well, back from the deliria of a cinephile and to this film. almost mentally retarded in her adoration of her uncle. But this child-woman is about to wake up from her pipedream. don't want his picture to be taken and 2 men turn up and start to snoop around, supposedly for a questionnaire, but look like cops. 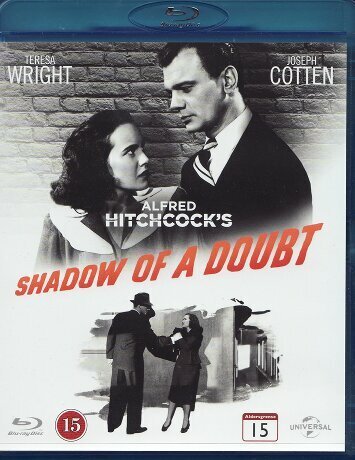 plot the death of his favourite relative in one of Hitchcocks most riveting psychological thrillers". very un-Hollywood-like but very believable behaviour when she's quite sure of uncle Charlie actually being a killer.